The 2D CAD software QCad 3.3 has been released with a focus on block attributes. Block attributes can be used to define variable, dynamic text entities in blocks. Watch this screencast for a brief introduction on creating and using block attributes with QCAD. QCAD is available in Ubuntu Software Center by default, but it’s old. This tutorial is going to show you how to download & install the latest package (so far, it’s 3.3) in Ubuntu 13.04 Raring, Ubuntu 13.10 Saucy, Ubuntu 12.04 Precise and their derivatives such as Linux Mint and Elementary OS. 1. Go to Downloads folder, right-click on downloaded file and go to its Properties window. 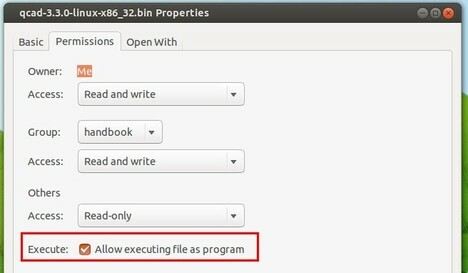 Check on ‘Allow executing file as program.’ under Permissions tab. hi..i followed steps that you mentioned to install qcad in linux. but i haven’t got any result. its showing’ no such file or directory’ .please give me some solution. i want to learn autocad. but it can’t be installed in linux.